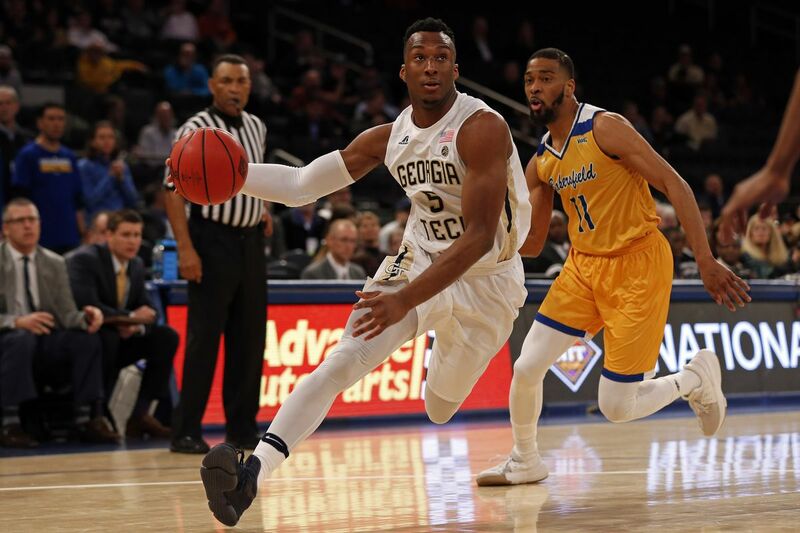 Josh Okogie was widely unknown until he entered for the 2018 NBA Combine draft where he pulled off impressive stats. He is a Nigerian-American professional basketball player for the Minnesota Timberwolves of the National Basketball Association (NBA). Though a good performance at the combine does not indicate pro success more than a bad performance does failure, it is still preferred over a sub-par showing. Here is all you need to know about the Wolves’ first-round selection. He was born Joshua Aloiye Okogie, the fourth of five children in Lagos, Nigeria to his Nigerian parents, Pius and Anthonia Okogie on September 1, 1998. His siblings include Evaristus, a dentist, Nathaniel who played soccer at Brewton-Parker College, Rachael and Emmanuel. After his family moved to the US, they resided in the east of Atlanta from where his basketball exploits took off. His favorite basketball players of all time include the dunk icon Michael Jordan, Kevin Durant, and Steph Curry. As a child, Josh was dexterous and showed off great skills playing the piano, violin, and tuba but had to give them up to focus on basketball in the ninth grade when he was 11. That decision has finally paid off, taking him all the way to the NBA. He attended Shiloh High School in Snellville, Georgia where he had a standout career after which he received an athletic scholarship from Georgia Tech. As a freshman, he averaged 16.1 points, 5.4 rebounds per game and made the 2017 ACC All-Freshman Team. In his sophomore season, he led Georgia Tech in scoring with 18.2 points per game and was selected to the third team 2017-2018 All-ACC which prompted his decision to file as an early-entry candidate for the 2018 draft. Also, he took part in the 2017 USA Basketball Men’s U19 World Cup on June 22, 2017. However, he wasn’t very certain about testing the waters of the NBA until after the draft combine. His performance therein impressed the scouts and pushed him up the draft boards. He moved from a possible second-round pick to a first-round status and was prized for his athletic ability and relentless effort. Today, two-way players have become one of the most important things in the NBA. A player who is both offensive and defensive hybrid becomes a primary asset both in the regular season and playoffs. Thus the attacking, athletic, tough-minded player with defensive versatility, Josh Okogie attracted the Minnesota Timberwolves coach Tom Thibodeau with his rare athleticism and toughness. The Timberwolves selected him in the first round (20th overall pick) making him the highest drafted Nigerian player since Michael Olowokandi, who was selected first overall in the 1998 NBA Draft and the third Nigerian to be selected in the first round since 2000. With the Wolves, he would finally get the chance to play alongside one of his comparison, the versatile player he sees himself becoming, Jimmy Butler (a four-time NBA All-Star guard). At last, Josh had dared to jump into the waters with his both feet unwary of the waves and storms that could arise. In addition, knowing that he is where he is supposed to be, makes it all the more an adventure worth exploring. Josh Okogie is a long-armed player with great physical tools and intriguing upside, especially on the defensive end. Moreover, in a game that is fast becoming positionless, he is a top asset as a two-way player combined with his ability to play multiple positions. Just like Butler who takes pride in both ends of the floor, Okogie could also be an offensive threat (his offensive game is highly technical) as well as guard, rebound, and push the ball. His vertical leap of 42 inches which tied for the highest at the combine shows his ability to guard multiple positions. Though his college career had its shortcomings – some ball-handling and shot selection issues – which could be due to lack of enough talent around him, with the perfect combination of size, length, and toughness, he can compete in any defensive scheme. Furthermore, he possesses an excellent blocking skill on the weak side, natural shooting touch and an ability to get to the rim. He also showed some consistency with his shots going by his college stats; 38.4% on 3-point attempts as a freshman and 38% in his second season. Also, his massive 7-foot wingspan should help him play some small forward in bench lineups. With these, there’s potential for him to be a better finisher in the NBA than he was in college.